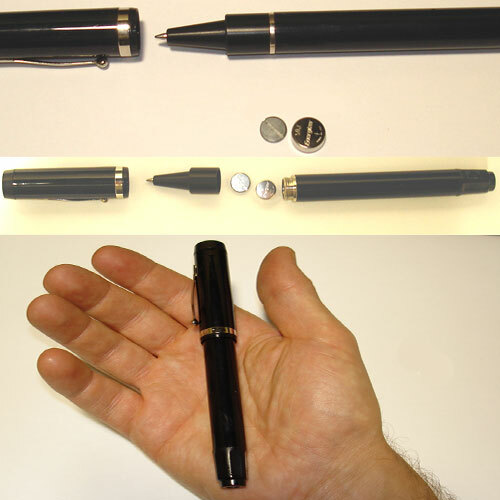 Disguised in an ordinary pen, the Pen Transmitter is small, lightweight, and discreet. When secrecy is needed, and you need more spy equipment that will work well, consider using Pen Transmitters for your covert audio surveillance operations. Using advanced surface mount technology, the transmitter, microphone, and batteries are all housed in the upper barrel section of a high quality pen. This refillable ballpoint pen can be used as an ordinary pen for writing. Spy gadgets like our Pen Transmitter can be easily positioned for clear transmission, and is an excellent choice if the environment is likely to be noisy.